Senate Tired of Your E-mails, Phone Calls; Expected to Pass Bill that Will Keep You From Getting Needed Information. Without a doubt, this could be the most important letter I have written you. The U.S. Senate is poised to pass Senate Bill 1 (Section 220), which would effectively keep AFA and every other pro-family organization in America from providing you information on bills in Congress. Under Senate Bill 1 (Section 220), we would only be able to provide you information on a bill at a high cost and at great danger of being penalized by Congress. To put it bluntly, members of Congress are tired of getting your e-mails and phone calls, and Senate Bill 1(Section 220) is designed to keep information from you that might inspire you to call or write your senator. Click Here to read AFA's review of Senate Bill 1 (Section 220). The new Democratic Senate thinks that if it can keep you from getting information—which is what Senate Bill 1 (Section 220) would do—then it will not be getting e-mails and phone calls from you. Senators favoring this bill are simply tired of hearing from you. That is the bottom line. They don’t want to hear from you. They don’t want you to be informed. They want to silence you. How? By simply keeping you from receiving information that AFA provides. I know that language is strong, but Senate Bill 1 (Section 220) will do exactly what I’ve said. 1. Send an e-mail to your two senators now! 2. Call your two senators at 202-224-3121. (Simply ask for one senator. Then call the other one at the same number. Ask your senators to vote against Senate Bill 1 (Section 220). 3. Please forward this to your friends and family. It is vitally important that they know what members of the Senate are trying to do. 4. Print this information, and share it with members in your Sunday School class and church and urge them to send an e-mail and call. If you think our efforts are worthy, would you please support us with a small gift? Thank you for caring enough to get involved. Steve and Janet have recorded two pilot TV shows for their new series entitled "Defenders of the Faith" which was the creation of Joe Reynolds of Skyline Productions in Phoenix AZ. 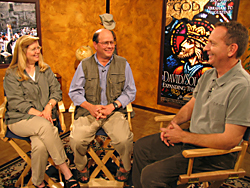 Joe is the videographer and producer of Steve's "Footprints of God" DVD series and decided it would be good to make some exciting, content-filled, entertaining TV programs for Catholic television. So, he built a set, we flew out and — lights, camera, action! To read about the new TV programs, you can click here or on the picture to read the article written by the Catholic Sun News. To see our new Defenders of the Faith.TV website, click here.